Manchester City winger Leroy Sane has announced the arrival of a daughter - a day after leaving Germany's team hotel for "private reasons". Germany said on Friday that the 22-year-old would not be available for Sunday's friendly with Peru following talks with head coach Joachim Low. And he revealed on Saturday: "Incredibly happy to let you know about the birth of my daughter last night." Announcing his baby news on social media, Sane gave "special thanks" to the Germany set-up for allowing him to leave the camp. 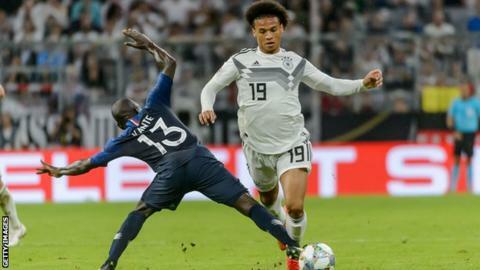 Sane, who made a brief substitute appearance in Thursday's Uefa Nations League goalless draw with France, was left out of Germany's squad for the World Cup in Russia. Germany tweeted on Friday that after discussions with Low, "Leroy Sane has left the team hotel in Munich for private reasons". He was left out of the 18-man squad for their most recent match, a 2-1 Premier League win over Newcastle on 1 September, although manager Pep Guardiola afterwards rejected reports that he was unhappy with the player's attitude.